There are hooks-a-plenty on the new one from EyeRollers. Hidden Holiday is only 7 tracks in total. Not sure if we’re talking about a short album or a long EP here. Either way, it appears evident that the band wanted no filler, just grade “A” songs. And they succeeded. The ringing guitars and harmonies of “Both Ways” make this an excellent opening track. I love the short, memorable chorus, here. Similarly, “Turn Around” has a fantastically hooky chorus. The jangle of “How Would I Know” pulled me in right away, too. However, the most noteworthy track here is “Majorca”. Not only are the harmonies great here (and throughout the entirety of Hidden Holiday), it’s got a psych-pop vibe that’s absolutely wonderful. From backwards guitar loop to Revolver worthy guitars, “Majorca” is one of my favorite tracks of 2017. EyeRollers’ Hidden Holiday is an outstanding album. And like fellow power poppers Elvyn, the band is from Ontario. So, if you’re up in those parts, please go to one of their shows. Let me know if EyeRollers are as outstanding live as I’m guessing they are. And while you’re there, have a Molson for me. 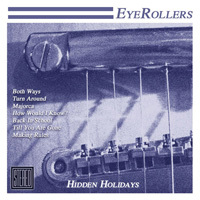 You can get EyeRollers Hidden Holiday at the band’s Bandcamp page.